I am a Wesleyan. There is no doubt about it. While our polity and some things within our United Methodist Church may frustrate me, I am a Wesleyan. I am a United Methodist. I returned home because of many factors, but mainly because of the Wesleyan notion of grace to all and for all, and the Wesleyan notion of holiness of heart and life. So, I am a deeply committed Wesleyan. That said, in today’s theological landscape, I have a growing admiration for many of the dominant evangelical thinkers of this day, who also happen to be Calvinist. I have a deep and abiding respect for Calvinism. While at Mississippi College, probably my most meaningful and enjoyable religious experience was as part of the RUF (Reformed University Fellowship). I actually audited a class at RTS (Reformed Theological Seminary) in Jackson, and worked on staff at Twin Lakes Camp, which is owned and operated by First Presbyterian Church, Jackson. So, have been exposed in many ways and through many years to Calvinist thought. And while I do not agree with it, I deeply respect it. In today’s evangelical world, Calvinism is becoming the dominant strain of theology. From such noted preachers and authors as John Piper, Matt Chandler, Tim Keller and Mark Driscoll to large-scale college events such as Passion, and even to Christian artists like Lecrae, Calvinist theology is the one that is being espoused. And as Wesleyans, we don’t like it. We don’t understand it. Because we feel (and in my opinion, rightly so) that our theology is better. More hopeful. Just a better theology. So, it’s easy for us to say, well, the only reason why folks like Calvinism is because it gives “easy answers.” It’s easy to lay everything at God’s feet. No work required by us. And while I do think there is some truth that, I think that misses what’s going on. I see my students at Asbury being attracted to it, and frankly, my favorite author and preacher at this point is Tim Keller. I give his book, “The Meaning of Marriage,” to everyone that I can. It’s probably the best book on marriage I’ve ever read. So, I just wanted to share what I think is happening, and why Calvinism is so appealing to so many folks. First, I think one of the things that is attractive to Calvinist theology is that they truly take the reality of sin and depravity seriously. Now, do they go overboard? Yeah, they take it too far. But, they stress over and over again that we are each sinful. We are each broken and in need of salvation and grace. We can’t earn it. And sin affects everything, all of creation, every act of our lives, every thought we take, all of it. They nail down the fact that we are sinful. And that hits folks were they are. People, especially teenagers today, are living a life of excess, and they really do understand that all is not right. At the end of the day, they are broken, they are in need. The lives that they live leave them empty. They make wrong choices. They are sinful. So am I. I am a broken, sinful man in need of God’s redeeming grace. They talk about sin and the reality of its affects on humanity it personal terms. We don’t, or if we do, we do it badly. Calvinists spend time reflecting on their sin and need for Christ. We spend time talking about how good we are. Calvinists feel as though they are undeserving of God’s grace. We can sometimes act like God is sure lucky to have us on His team. Boy, He sure lucked out when we chose Him. I’m not saying that we need to hammer sin. But, if we are not really sinful, then what did Jesus come to “save” us from? Second, closely linked to sin, is their emphasis on Jesus. I really don’t like Mark Driscoll. He’s arrogant and is often in need of a huge dose of humility. But you know what he does time after time after time? He takes it back to Jesus. He takes everything back to Jesus and our need for Him and His grace and salvation. It all comes back to Him. And as much as I don’t care for Driscoll, he’s right. It all comes down to Jesus. And our Calvinist friends do that so much better than we do. You can come to Annual Conference, and many local churches, and not hear one word out about our absolute need for Jesus. Sometimes we focus on Jesus’ call to us to help others, which is so important. But, as much as we are the hands and feet of Jesus, there are some things (many things, like the problem of human sin) that we can’t fix or really even help. If Jesus is mainly a great moral example and an example of God’s love, then He is symbol that offers no practical hope. If He is the Son of God and the Savior of humanity then He offers hope in every situation. We don’t talk about how Jesus truly and utterly changes lives. They do. I have put it like this: To the mother of three who’s losing her job and her family, her question is this, can Jesus help this? And that is attractive to many, many people. So, to say that people are attractive to Calvinism because of “easy answers” is, I think, a great misreading of the situation. 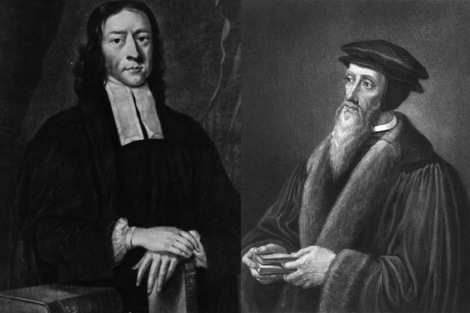 There is much that we can learn from Calvinism to spark a revival of Wesleyan thought. My prayer is that with all that we do, we can point folks to Jesus Christ, for He is where life is found! I agree Andy. I think both sides (even though I don’t think it is a “battle”) can stretch it too far to one side or the other. I do rest in the fact that God is big enough to handle it, AND in the fact that he tells us to “continue to work out your salvation with fear and trembling, for it is God who works in you to will and to act according to his good purpose” (Phil. 2:12-13). The more I read this verse the more complicated it sounds. It seems to almost argue both sides at the same time.